* We’re sorry you missed this tour. Please contact us if you’d like to be put on the wait list (if/when someone cancels) or if you would like to join us on a future Ireland tour! Register now via PayPal by clicking on the Register Now button. You can sign in as a guest and do not need a PayPal account. Note: Cancellation fees apply. Please read our Booking Terms and Conditions before registering. The tour begins on October 13, 2019, with a full day of touring. We encourage you to arrive the previous day (or earlier) so you can take advantage of this first full day. If you arrive on Day 1, you may join the tour in-progress. We can help you book additional nights in Dublin and your transportation from the airport—neither are included in the tour cost. NOTE: This tour starts in Dublin and ends in Shannon. You can either schedule your flights as such or you can fly roundtrip Dublin and then make your way to Dublin (via flight, train, bus or share a private ride with other tour participants) at the end of trip. Please check the Ireland FAQs for additional information. After a wonderful breakfast at the hotel, this first day on the Emerald Isle will be spent touring the country’s sophisticated capital of Dublin! We’ll start the morning with a visit to the iconic Guinness Storehouse where you can take either a guided tour or a self-guided trip through this seven-story building and sample some of the dark stuff while enjoy sweeping 360º views from the Gravity Bar. We’ll then visit Trinity College Library and the Book of Kells exhibition. Book lover or not, you’ll be astounded by the amazing collection here. Afterward you can enjoy lunch (on your own) at one of the many nearby restaurants or cafes. We’ll end our afternoon with a visit to Kilmainham Gaol (jail), one of the largest unoccupied gaol’s in Europe. We’ll have a guided tour that explains its role in virtually every act of Ireland’s painful path to independence. In the afternoon, we’ll head back to the hotel to relax, shake off jet-lag or shop prior to our welcome dinner. Overnight in Dublin at the Camden Court Hotel or similar. HIGHLIGHT! Today we’ll get an excellent overview of Dublin and experience the highlights of this very sophisticated, yet historical city. Before leaving the city this morning, we’ll make a short visit to Christ Church Cathedral, officially known as the seat of both the Church of Ireland and Roman Catholic archbishops of Dublin. We’ll then head off to take part in a cooking class! Here, we’ll learn how to make (and eat!) a couple of traditional Irish dishes. 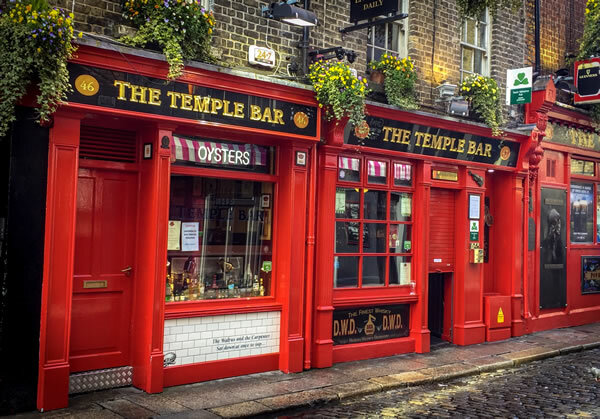 Afterward, we’ll have the afternoon free to explore and then enjoy dinner (on our own) at one of Dublin’s many wonderful pubs or fine eateries. HIGHLIGHT! One of the best ways to get to know a culture is through food and with a local who can teach you the finer points of how to cook local dishes. Today we’ll have a hands-on cooking class where we’ll get to enjoy the fruits (as it were) of our labor. After breakfast, we’ll travel to County Wicklow and to the country estate of Powerscourt House and Gardens, home to what is considered one of the top gardens in the world. We’ll have time to wander around this beautiful area and have lunch at the estate (on our own). We’ll then continue to the village of Avoca to see the famous traditional handweavers at work at the Avoca Mill. On our way back to Dublin, we’ll visit Glendalough, a 6th century monastic site that’s nestled in a valley in the Wicklow Mountains. Upon returning to Dublin, the remainder of the day will be free for sightseeing on your own, shopping and dinner. HIGHLIGHT! Today is all about Ireland’s countryside with its traditions, charms, and beautiful landscape. This morning after breakfast, we’ll check out of our hotel and make our way west toward the dynamic city of Galway. Along the way, we’ll stop at Clonmacnoise, an early Christian site founded by St. Ciarán in the mid-6th century. 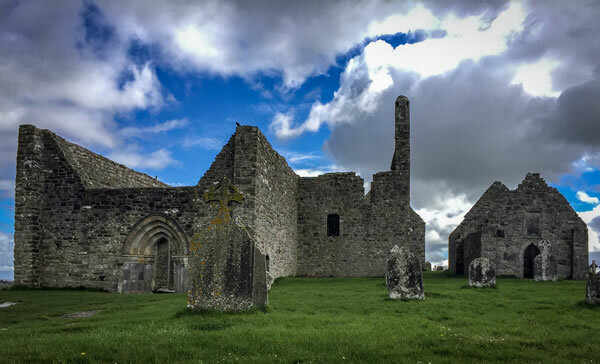 Located on the eastern bank of the River Shannon, we’ll find the ruins of a cathedral, churches from the 10th – 13th centuries and the largest collection of early Christian grave slabs in Western Europe. We’ll have lunch (not included) at a nearby restaurant. We’ll drive onward to Galway where we’ll check in to the hotel. We may have a bit of time to explore before dinner. Dinner and overnight in Galway at the Park House Hotel or similar. 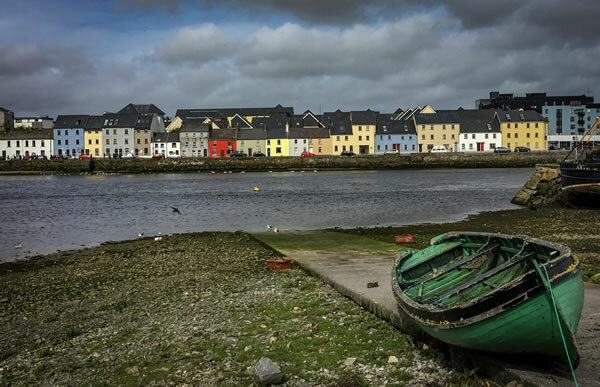 After a leisurely breakfast, we’ll take a walking tour of Galway with a local guide who will help bring the city (and Ireland) alive with stories! You’ll then have the rest of the day free to wander the narrow pedestrian-only streets and alleys of this magic City of the Tribes! Once a city of merchants (tribes), Galway is now an artistic and contemporary destination, known as one of Ireland’s most Irish of cities. There’s so much to enjoy here, including the Spanish Arch, Lynch’s Castle and the Galway Museum. Overnight in Galway at the Park House Hotel or similar. HIGHLIGHT! What’s not to love about Galway?! This very manageable city has lots of things to do but somehow maintains a small town feel and attracts some of the best buskers in the world who perform in the streets. After breakfast, we’ll take the ferry to Inis Oirr, the smallest (and many say best!) of the Aran Islands. This island is a splendid example of Celtic and early Christian heritage. The island is rugged and natural with thatch-roofed stone cottages dotting the landscape. In the afternoon, we’ll take an Aran knit workshop, attend an Irish brown bread-making workshop and then have dinner at a local restaurant. Overnight on Inis Oirr at various B&Bs. NOTE – On this day, we’ll only be carrying a small overnight bag for our two nights on Inis Oirr. We’ll leave the majority of our things secured with our driver who will meet us in two days. The ferry ride might be a bit rough. For those prone to motion or sea sickness might want to bring medication or a natural form of natural remedy. HIGHLIGHT! Today we’ll get to experience the Wild Atlantic Way from the water when we take the ferry to Inis Oirr. We’ll instantly be transported back in time once we set foot on the Aran Islands. 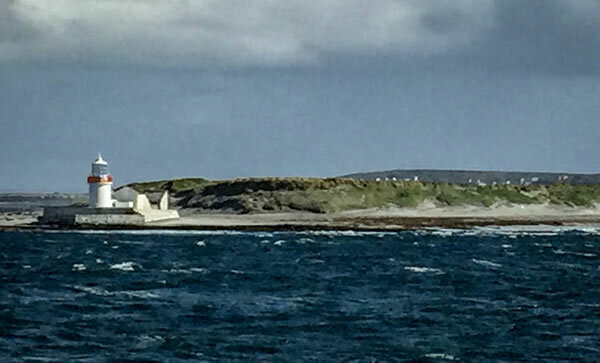 Today we’ll take the local island ferry and venture to the largest Aran Island, Inis Mor. Here, we’ll take a tour that will include a visit to the island’s main attraction, the stone fort, Dun Aengus. We’ll have lunch at a charming local restaurant (on our own) and have a chance to pop into a few of the local shops as well. Upon returning to Inis Oirr, we’ll enjoy dinner at a local restaurant before returning to our B&Bs for the night. After breakfast, we’ll take the ferry to Doolin where we’ll meet back up with our bus and driver. We’ll have a chance to stroll around this sleepy fishing village (known as the home of traditional Irish music! ), to souvenir shop, grab a cup of coffee or have lunch (on your own). 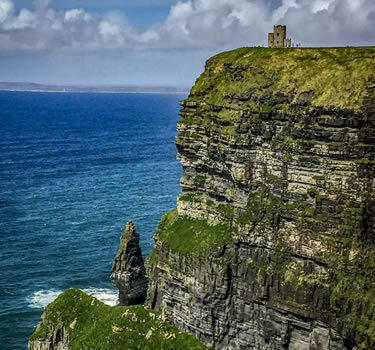 We’ll then visit one of Ireland’s natural wonders and most popular destinations in the country: the Cliffs of Moher. The cliffs rise to over 700 feet and provide magnificent 360 degree views. We’ll have time to walk around and photograph the area before heading to the charming village of Adare. Overnight in Adare at the Woodlands Hotel or similar. HIGHLIGHT! You’ve seen them in countless photos, but the Cliffs of Moher are far more beautiful and dramatic in person. This will definitely be one of many highlights of the tour. This morning after breakfast, we’ll have a chance to walk the streets of the small town of Adare. This quaint village is known for its thatched roofed cottages, beautiful park and monastic ruins. We’ll then head to the Dingle Peninsula. Perhaps not as well-known as the Iveragh Peninsula where the Ring of Kerry is located, the Dingle Peninsula is less touristy but every bit as beautiful. After driving the spectacular road around the peninsula, we’ll have lunch (on our own) in the small fishing port town of Dingle. Here we’ll also have a chance to try our hand at making pottery at Louis Mulcahy’s studio before heading to our hotel in Dingle. Overnight in Dingle at Dingle Skellig Hotel or similar. HIGHLIGHT! It’s difficult to say which you’ll love more: the drive around the Dingle Peninsula or the truly charming town itself. Either way, this will be another incredible day on Ireland’s west coast. Today we’ll travel onward to Killarney where we’ll have lunch in town before checking in to the hotel. We’ll then have the afternoon free to explore, relax or enjoy our beautiful hotel on the lake. We’ll have a wonderful dinner at the hotel and then have a chance to break out our dancing shoes during a traditional Irish dance workshop! Overnight in Killarney at The Lake Hotel or similar. Today after breakfast, we’ll visit Jameson’s Old Midleton Distillery and learn how their whiskey is made and how it differs from whiskeys made elsewhere. After a fabulous tour and tasting, we’ll have lunch at the distillery (on our own). We’ll then drive to Blarney Castle where the famous Blarney Stone can be found. We’ll walk the grounds, tour the gardens and, of course, kiss the Blarney Stone to receive the luck! Tonight we’ll have dinner on our own so you can explore Killarney’s many restaurant options. Today we’re going to experience more of Ireland’s legendary scenery as we drive the Ring of Kerry. The road winds around Ireland’s highest mountains, the Macgillycuddy’s Reeks, and the Atlantic coast. This is called the Wild Atlantic Way for a reason and you’ll soon see why. We’ll continue through the remote villages of Cahirciveen and Waterville—one of Charlie Chaplin’s favorite places—and pass through the colorful village of Sneem. We’ll also stop at Moll’s Gap to see the Three Lakes of Killarney. We’ll even have a chance to stop and stroll around the Muckross Gardens located on the shores of Muckross Lake. Dinner will be on your own again so you can choose your preference. Perhaps light bar fare or a full dinner at the hotel or something in town suits your fancy? HIGHLIGHT! 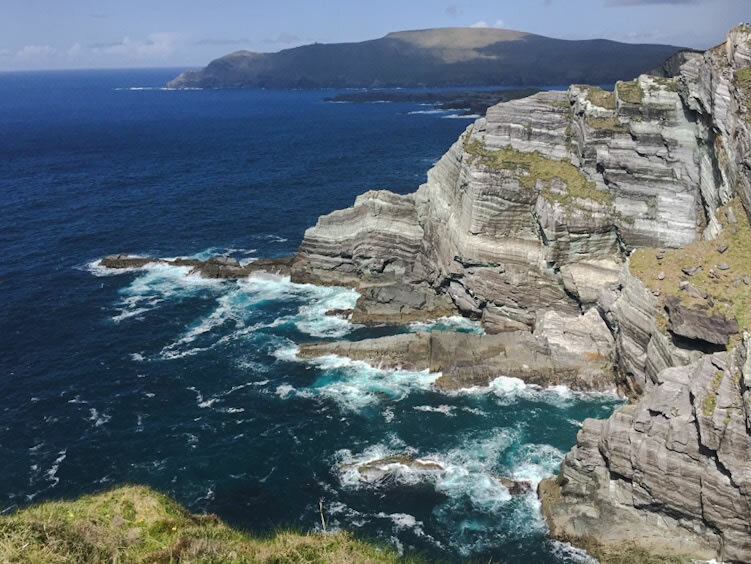 Today will be a full day with lots of eye candy as you take in sights that you may have only previously seen in dramatic photographs of the Ring of Kerry. Today, on our last full day in Ireland, we’ll leave Killarney and visit Bunratty Castle. 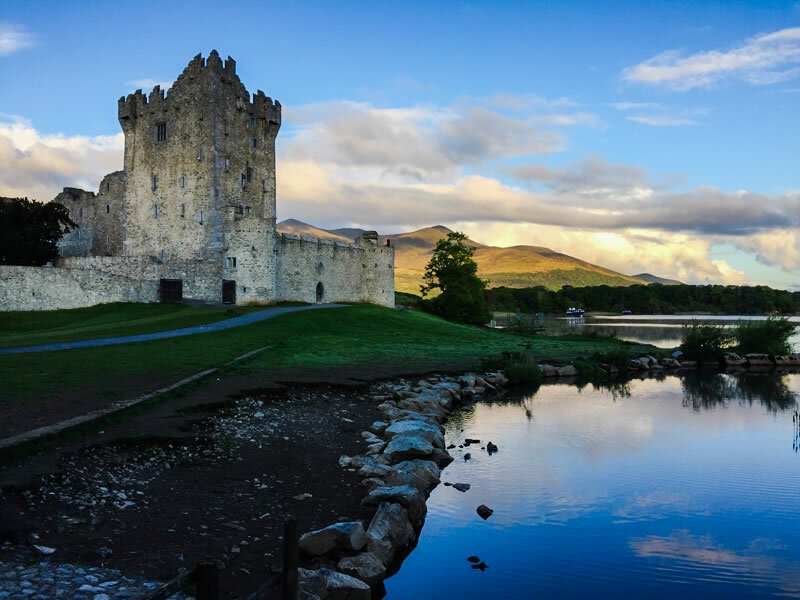 Dating back to the 1400s, this is one of the most well-restored and authentic castles in Ireland. 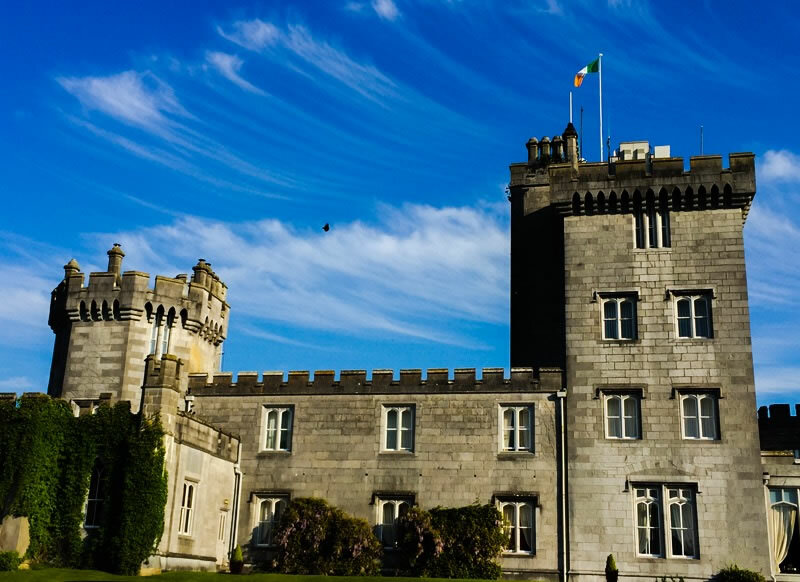 We’ll tour this beautiful and ancient fortress and then drive onward to check in at the spectacular Dromoland Castle. We’ll have a chance to settle in and enjoy afternoon tea for a full castle experience. In the evening, we’ll head out for our final dinner at a local favorite restaurant. Overnight in Shannon at Dromoland Castle. HIGHLIGHT! This will be a wonderful final day in Ireland as we experience not only sleeping in a castle but also touring one of the most interesting castles in Ireland. Today you can depart via nearby Shannon Airport for home (or onward to your next destination) or return to Dublin for your onward flight. ** Itinerary subject to change without notice. NOTE – prices are in US dollars based on Euro conversion rate of 1.17 as of 9/21/18. If price fluctuates by more than 5%, there may be an increase in final tour cost. Tour price includes: 13 nights accommodation in lovely 3- to-5- star hotels, sightseeing entrance fees, activities as outlined in itinerary, 26 meals, an English speaking driver/guide and tips for driver/guide(s). Tour price does not include: International flights to Dublin and from Shannon, Irish visa (if required), travel insurance, some meals, souvenirs, personal purchases (such as books and snacks) and beverages. Bottled water is not included at our request – we encourage you to bring your own reusable bottle for the tour. We recommend Insure My Trip for travel and/or evacuation insurance. This trip is limited to 15 women and requires an $800 deposit to secure your spot. Final payment due no later than August 13, 2019. We love checks as it helps keep our costs down by avoiding credit card fees. If you’re able to pay the deposit or full amount by check or wire transfer, we’ll not only love you more but we’ll send you a free copy of one of Beth’s books (your choice which one). ** U.S. residents receive a print copy, international residents receive a PDF. 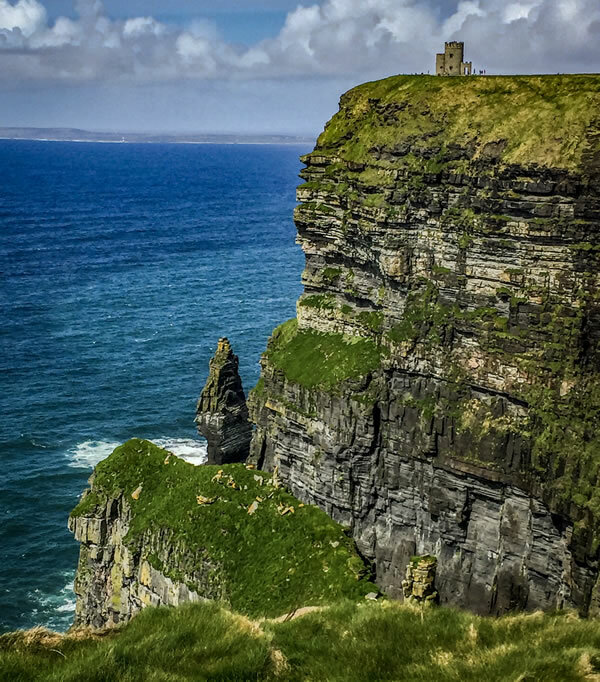 After hearing personally from dozens of people absolutely captured by their time in Ireland (and dozens more who wanted to see it for themselves), Beth decided it was time to travel there and discover the charms of this island nation for herself. Suffice it to say, she was as swept away by the Emerald Isle as everyone else—and she knows you will be, too! 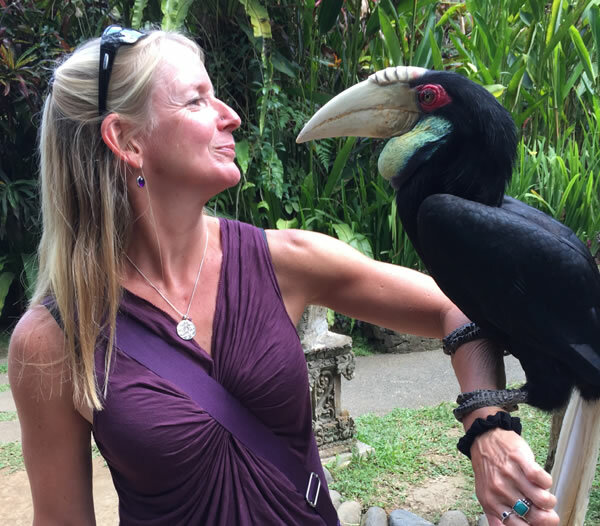 Beth is the author of the Wanderlust and Lipstick guides including The Essential Guide for Women Traveling Solo and For Women Traveling to India. She is also the publisher and founder of Wanderlust and Lipstick and WanderTours and hosts the Be Bold podcast which can be found through your favorite podcast provider. She is also the founder of the WanderWorld Foundation.